This shop is located in Ubud, Bali, just to the left of Dewi Sita Street on Gootama Street. There are plenty of bottles filled with handmade jam made from the tropical fruits grown in Bali. Michele’s jam includes only 1/3 sugar of normal ones— making it very healthy. 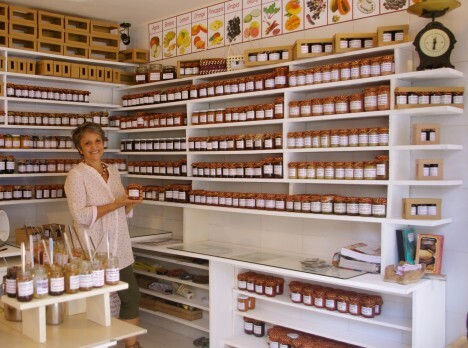 The jams are also made with great care to bring out the natural sweetness from fully ripened fruits. Various flavors are offered at the store, from tropical fruits to original blends, including guava (the most popular), mango, papaya, soursop, passion fruit, lemon chili, and orange cinnamon. You can freely try as much as you want,, while enjoying crepes and tea in the shop. One of the reasons these are recommended for souvenirs is the bottles are capped with BATIK, the gorgeous traditional Indonesian fabric. The manager of this shop is Wayan, a Balinese lady with a sunny disposition, and loves talking with customers. How about enjoy shopping while having a chat with her? It is sure to be a great time.